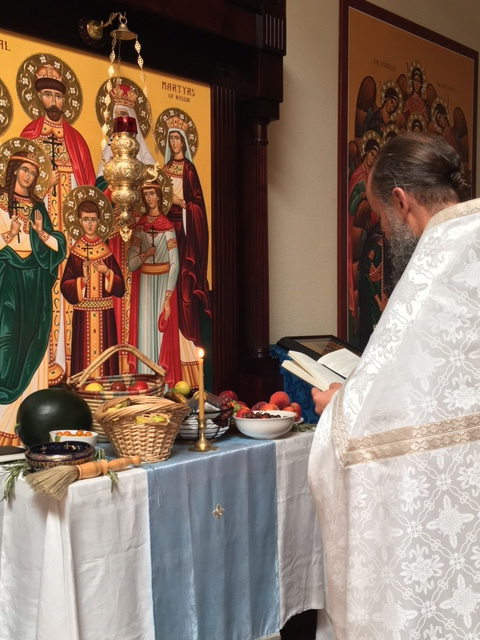 Father Andrew Cuneo performs the traditional blessing of fruits and vegetables following the Divine Liturgy on the great feast of Transfiguration, August 6. A peculiarity of the Divine Service on the Feast of Transfiguration is the consecration of fruit and vegetables as thanksgiving to God for the blessed fruits of the earth, good weather, and His provision of our daily bread. 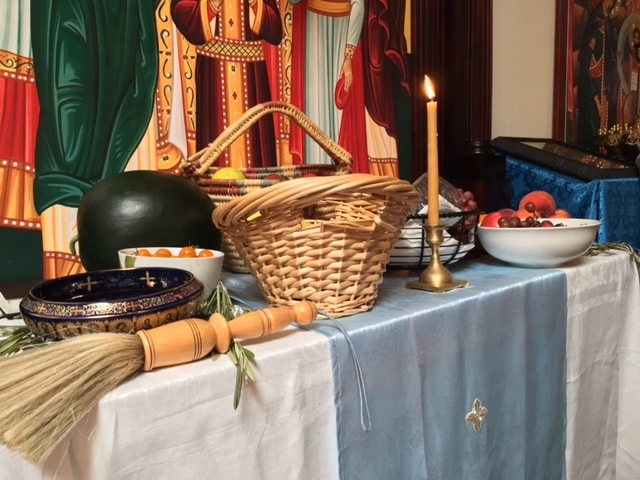 It is the tradition of the Day of Transfiguration to consecrate grapes, apples and other fruit after the Divine Liturgy. The custom of bringing fruit to the temple for consecration originates in Old Testament times (Gen 4:2-4; Ex 13:12-13; Num 15:19-21; Deut 8:10-14). The Apostles brought this tradition to the Church of the New Testament (1 Cor 16:1-2). Instruction regarding bringing fruit to the church is found in the Third Rule of the Apostolic Canon, the earliest collection of ecclesiastic laws (canons), known since the second century. In Greece, August is the month of ripening of fruit, mostly grapes and new ears of corn. Since early times, the faithful have been bringing them to the church for consecration and as Thanksgiving to God. St. John Chrysostom wrote, "The plowman receives fruit from the earth not so much for his labor and diligence, as out of goodness of God Who grows this fruit, because neither is he that planteth any thing, neither he that watereth; but God that giveth the increase." Grapes are brought to temple because they are directly related to the Eucharistic sacrament; that is why in the prayer for consecration of grapes the priest says, "Bless, Lord, this new fruit of the vine which reached ripeness because Thou didst kindly provide good weather, drops of rain, and stillness. Let the partaking of this fruit of the vine make us joyful. And give us the honor of offering this fruit to Thee, as the gift of cleansing of sins, altogether with the Holy Body of Thy Christ." In the first centuries of Christianity, the faithful brought forth to the temple the fruit and crops of the new harvest: bread, wine, oil, incense, wax, honey etc. Of all these offerings, only bread, wine, incense, oil and wax were taken to the altar, while the rest was used for the needs of the clergy and the poor whom the church was caring for. These offerings were to express gratitude to God for all goods, but at the same time to help the servants of God and people in need. The consecration of bread and wine, eggs and milk and other food has been preserved to this day in the consecration of the artos in the church and meals at home on Easter. The blessing of flowers and tree branches is performed now on Palm Sunday, the days of the Holy Trinity and the Exaltation of the Cross, and on Sunday of the week of the Veneration of the Cross. Rice or wheatberries with raisins and honey (koliva) are used as offerings in services for the departed and at the memorial repast. Prosphoras are brought forth for proskomide everywhere even today.